“Star Trek Into Darkness” comes four years after director J. J. Abrams gave us “Star Trek”, a highly exhilarating reboot to a beloved science fiction film franchise that was dried up and limbo. It was a bold, fresh and much-needed take on characters that were introduced back in the 60s by Gene Roddenberry. 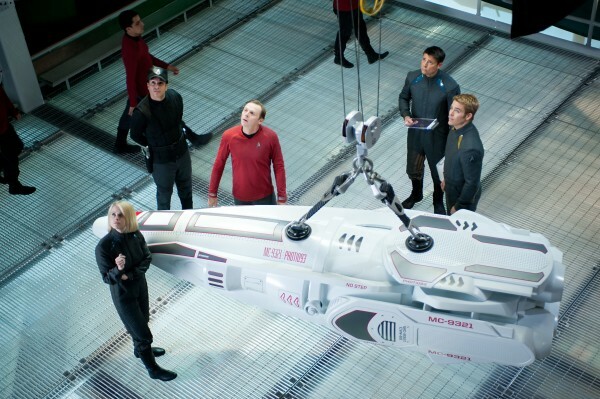 Boosted by a young, impeccable cast and a clever screenplay, Abrams and company confidently reestablished a sense of awe that had fans anticipating where this Enterprise crew would boldly go next. While still visually stunning and full of infectious camaraderie, the sequel lacks the same freshness that was present in the previous film. Regardless, at the end of this film I felt the same way I did when the last one was over – I didn’t want it to end. 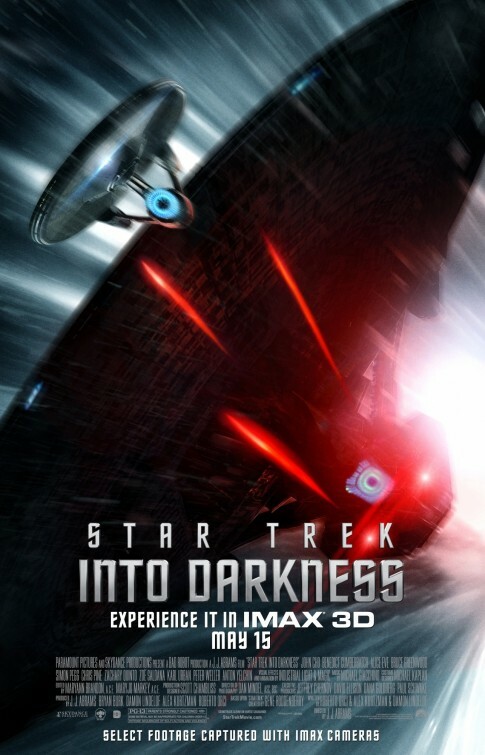 Abrams once again begins with a nail-biting opening that finds Captain Kirk (Chris Pine) breaking the Prime Directive of Starfleet in order to save the life of his First Officer, Mr. Spock (Zachary Quinto), on a volatile planet that is home to a primitive species. Upon returning back to Earth, Kirk gets demoted by his predecessor, Admiral Pike (Bruce Greenwood) and is separated from his beloved Enterprise and its crew. 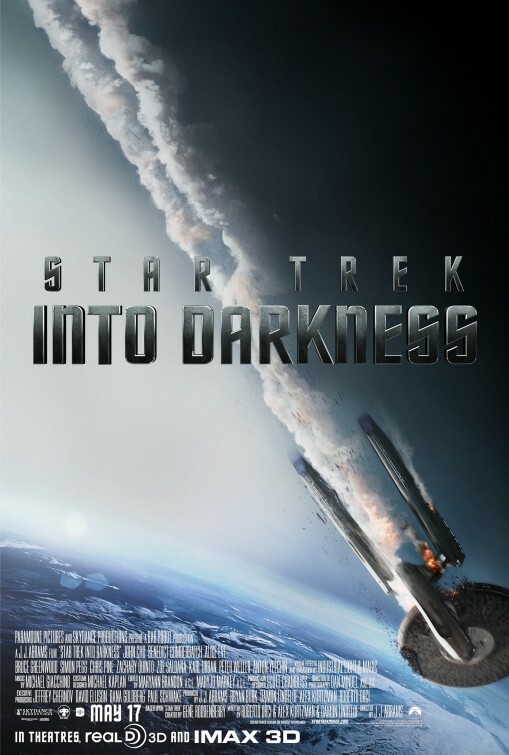 Before Kirk can feel the burn of his punishment, Admiral Marcus (Peter Weller) sends Kirk and Spock, along with Uhura (Zoe Saldana), Bones (Karl Urban), Scotty (Simon Pegg), Sulu (John Cho) and Chekov (Anton Yelchin), on a manhunt for John Harrison (Benedict Cumberbatch), a terrorist responsible for blowing up a secret Federation location in London. Accompanied by new science officer, Dr. Carol Marcus (Alice Eve, providing eye candy for Kirk), the crew soon learn they are in over their heads as they pursue this cold, superhuman killer in space. Along the way, they encounter Klingons and confront hidden truths about both the terrorist and the 71 long-range photon torpedoes that were loaded onto the Enterprise to take him out. To prevent Harrison from committing any further acts of aggression toward Starfleet, Kirk and his overwhelmed crew are tested to the edge in a broken and battered ship. This is a roller coaster thrill ride that rarely lets up and as for summer blockbusters go, it is also fun and entertaining. That’s what I’m left with most of all, days after viewing “Into Darkness”. At no point was I pulled out of the excitement of the picture, but that doesn’t mean I didn’t notice certain callbacks to previous Trek films, specifically the best of them, 1982’s “Wrath of Khan”, which will most likely have certain Trekkies up in arms. I just wasn’t bothered by them. No, I’m not going to go and spoil it for you as other reviewers undoubtedly have or will. As I took in the twists that returning screenwriters Roberto Orci, Alex Kurtzman and Damon Lindelof have woven into the film, I was reminded of the new timeline they had created in the previous film. It makes sense to me then that similar things will occur in this timelime, with some familiar events and interactions play out in different ways. Complaints will come in that this film is low on the intellectually stimulating science that many of the television episodes offered, but they forget that such an approach has never translated well to the big screen. 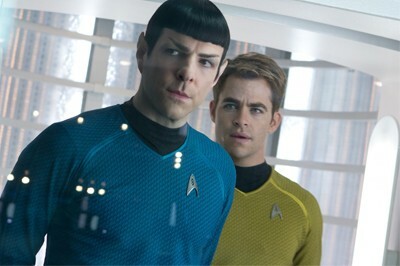 “Star Trek” films must be cinematic and grander in scope than what the small screen offered. That’s what worked for the best of the previous films and that’s what works here. There are also some obvious modern metaphors present here, but to be honest, they seem kind of overused and a little late to the game (in particular an unexplained 9-11 post-film text acknowledgement seems strange and unnecessary). That’s okay, because once again what stands out are the characters. Sure, Abrams dazzles with epic outer space visuals and fantastic action sequences that look and sound amazing, but it’s the actors that make this an enjoyable ride. The fun tension between Spock and Uhura, the bromance between Spock and Kirk and the always welcome comedic relief of Pegg (who has some of the best lines) and Urban (so dead-on as Bones). Cho and Yelchin aren’t given enough memorable moments, but there’s only so much time and at least there’s a nice bit when Sulu temporarily takes the helm. These actors are a delight to watch, especially Pine and Quinto, who comfortably return to these iconic roles, adding some emotional heft here to their fine nuanced work. 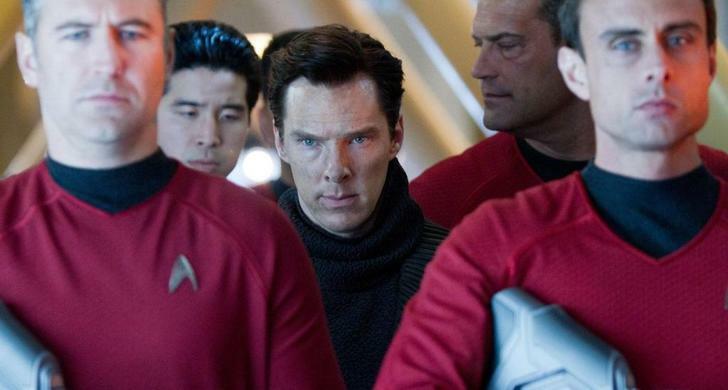 What British actor Cumberbatch lacks in villainous charisma, he makes up for in his ominous physical presence. The skinny actor who plays Sherlock Holmes has a baffling transformation into a broad-shouldered, velvet-voiced brute in “Into Darkness”. Like most movie villains in big-budget films lately, Harrison’s backstory and endgame seems a bit hazy, but with such an absorbing presence as Cumberbatch, such things can be overlooked. Any failings in the characterization ultimately belong to the writers anyway. It helps that these actors are surrounded by returning Abrams collaborators like cinematographer Dan Mindel and composer Michael Giacchino, to give the film a beautiful look and unforgettable score, providing an immersive and compelling atmosphere. In many ways, “Star Trek Into Darkness” is just as good as the film it follows. It’s worthy of repeat viewings (in 2D, please), which could either increase appreciation or evoke a new line of scrutiny. That remains to be seen, but right now I can definitely say that there’s much to appreciate and respect here. What Abrams has done with the Star Trek universe continues to be exciting for both longtime fans and a new audience and I can’t wait to see what he brings to that other famous sci-fi franchise. I wish you’d have written more about the moral of this fantastic nonstop action-packed scifi film. This is one of the very rare modern movies that teaches us what a real hero is. Terrorism is real and profound, and stems from hopelessness, intense anger and a misguided need for vengeance for real/imagined wrongs done upon the terrorists and “people of their kind”. If there’s one thing to be learned here it is that a real hero seeking justice does not act like a terrorist on a myopic path for revenge and retribution…A real hero is humane and guided by morals and compassion, even for his enemies. I think this theme needs to be reiterated in other films because violence begets violence, and we as a culture have been too desensitized to violence and using brute force to “get our way” especially when things appear unjust and unfair. (I believe that is one reason why bullying and terrorism exist). So many movies and tv shows glorify revenge — that violence and termination of lives are acceptable and even commendable if we and/or someone we love has been hurt/killed — instead of exemplifying that it is the restraint, courageous hero in his quest for justice who should be lauded for his audacity to do what is not only morally and ethically right, but also what is most humane, in the face of evil. I could have gone into more details about many themes and aspects of this film – I wanted to. But I chose to be a bit more concise than I usually am. You bring up some great points on terrorism and heroism. One thing both terrorists and heroes have in common is that they generally both feel like they are doing the right thing and that’s always cool to explore.